Having a nut allergy usually means getting to enjoy about 10% of normal holiday treats because I swear they’re all made with peanut butter or nuts. I decided to turn one of my favorite holiday treats that I can no longer enjoy into a safe, nut-free alternative for all of my fellow nut allergy people. Enter the nut-free buckeye made with sunflower butter. To me, sunflower butter literally smells and tastes just like peanut butter with maybe a hint of sunflower flavor. My family that can actually enjoy peanut butter disagrees with me, but they did agree that these were just as tasty as the original! I’ve got your back when it comes to flavor. My mission will always be to bring my readers TASTY (and healthier) recipe alternatives to some of your traditional favorites. 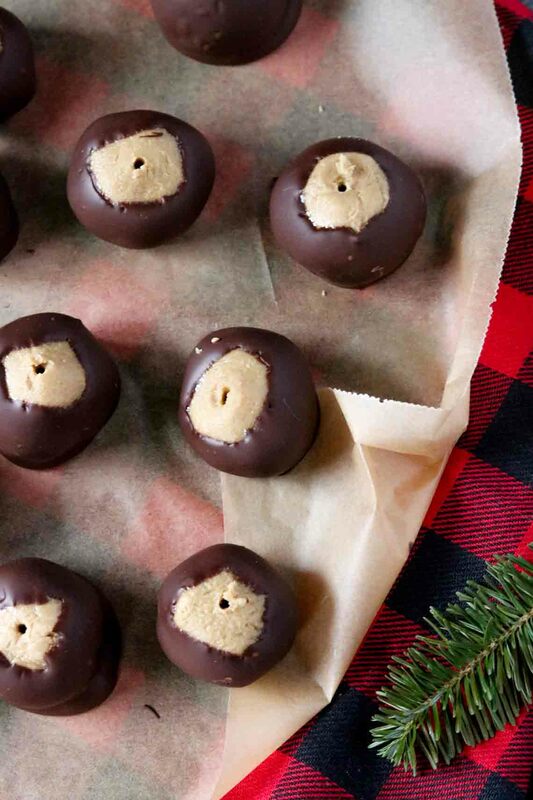 These nut-free buckeyes did not disappoint. Creamy center surrounded by sweet chocolate. Good thing I only make these one time a year! Bring these to your Christmas dinner or give them as treats to your friends and family! Soften butter ahead of time. In a large mixing bowl, combine the sunflower butter and softened butter and mix with a hand mixer on low until creamy. Add in powdered sugar and mix again with hand mixer until creamy. Using your hands, roll the dough into medium-sized balls and place onto a lined baking sheet. Melt the chocolate chips in the microwave or in a double-boiler. Remove the balls from freezer, then using a toothpick dip the balls into the chocolate covering about 3/4 of the ball. Place back onto the lined baking sheet. Let set for 15 minutes before serving. I love to find new nut free recipes, your recipe sounds delicious. Thanks for sharing. 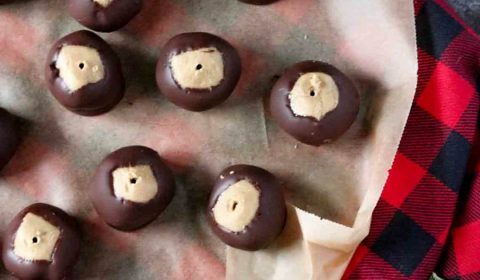 I’ve never had buckeyes before but this version with sunflower butter sounds delish! I have never tried buckeyes! I always see recipes for them, and they sound delicious, but it’s something that has always by-passed me. These sound like the perfect little treat for the Holiday season though, will have to give them a go! These look great! We have a family member with a nut allergy, I will have to pass this on to them. Saving this recipe! Looks easy and delicious! I have heard of sunflower butter before, but never tried it myself. I love that you used it to make buckeyes! 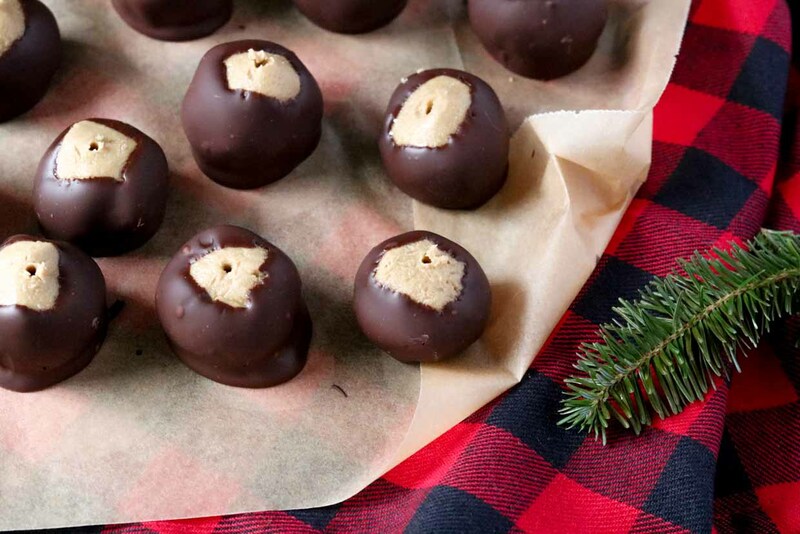 Such a great nut-free holiday treat. They look delicious! I can’t wait to try sunflower butter! Thanks for sharing this recipe! I used to eat buckeyes often until I found out I have peanut and tree nut allergies. Thank you so much for sharing this recipe. Now I can have buckeyes again! Woohoo! I’ve never heard of these before! Can’t wait to give them a try they look delicious! First time I hear about those little bites! They looks fantastic! Thanks for sharing! 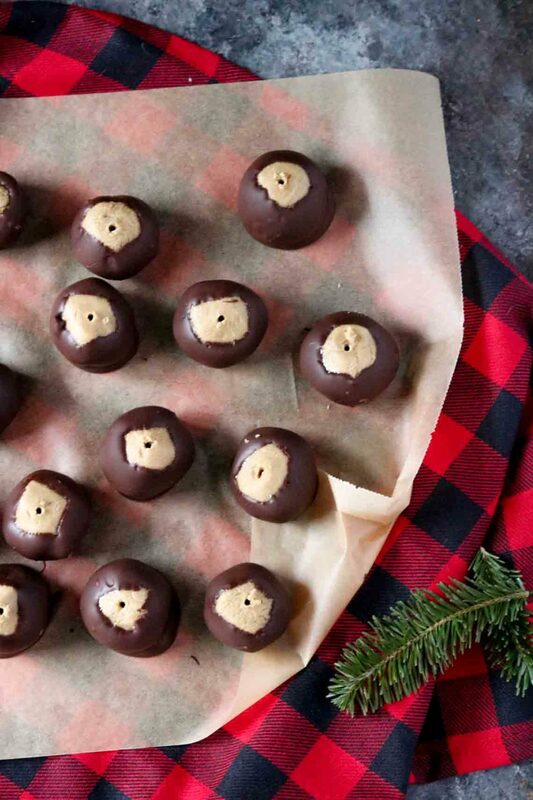 These look like perfect little holiday treats. I love sunflower butter…so delicious. Anything covered in chocolate is a winner for sure. Great idea to make a nut free option! This is definitely a good Christmas recipe, I should try it for Christmas. Thanks for sharing! Never tried this recipe before but looks so simple and delicious!